The SwiftlyDone solar outdoor light currently holds a 3.9 star rating on Amazon.com. It prides itself in being one of the simplest outdoor lights to install, however that may be the only thing it is best at. Let's figure out what is good and what is bad about this outdoor solar light. The SwiftlyDone solar outdoor light is small yet powerful. It sizes at just 4.5 x 3.4 x 1.6 inches and weighs only 4 ounces, making it small and light enough to be placed anywhere outside of your house, while not taking up a lot of room. Makes for a big surprise for unwelcomed guests. The light that comes out of this small outdoor fixture is decent enough to do its job. It puts out 80 lumens, which is fairly low, but it seems to be good enough. However, if you are using this for a security light, you may see that it falls a bit short. 80 lumens would be fine as a standard setting, but when you need something bright enough to scare away intruders, they may not be all that alarmed. Also, the bright light only remains on for 10 seconds, which should be more than enough time. There are also various modes for the light. It can be set to "auto on at night/ auto off at sunrise" or "dim light when no motion/ bright light when sensing motion". 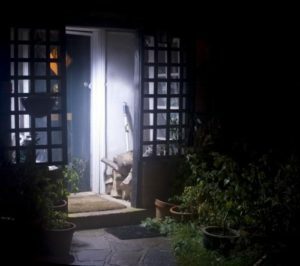 This is a great feature if you need a constant light during the night for above your back or front door, for example. The SwiftlyDone solar outdoor light features a 0.44 watt solar panel, which given the size of the device is perfect. It easily absorbs sunlight and charges the 600mAh battery during the day time so it can be used whenever it is needed at night. The body of the SwiftlyDone solar outdoor light is made out of plastic. However, it is completely weather-resistant, including heatproof. So there will be no issue leaving this out in the summer heat or winter cold. The light will function perfectly well under any weather circumstance. This solar outdoor light actually have some impressive features. It does, of course, have a motion sensor that activates the bright security light. The motion detection has a good length of 10-12 feet, with an angle of 120 degrees. It will easily detect any movement if you place it above any doorway. In addition, one of the biggest selling points of this light is that fact that it requires absolutely no wiring or tools to install. It is the one of the easiest devices to install because it features an adhesive backing. Simply peel the cover of the backing off and place on any surface you want. It can stick to any material like brick, stucco, wood, metal, glass, etc. Not much information was able to be found out about the company. However, we did find out that the trademark for SwiftlyDone was registered in 2015, so the devices have only been produced within the last 3 years. Also, on Amazon, the seller of this brand is 6th Avenue Shop, and the SwiftlyDone Solar Outdoor Light is their only product. However, they do have a 98% approval rating with nearly no negative reviews. The SwiftlyDone solar outdoor light is very small and lightweight, making it easy to stick at any location outside of your house. Speaking of sticking, the installation is insanely easy. Just peel off the cover of the adhesive, and place on any material you want. No extra wires, tools or work required. The strength of the solar panel and size of the battery make it so you will have constant access to light from this device all throughout the night. The length and angle of the motion sensor make it worry free. Whenever it senses motion, the bright light will activate. In addition, you can even set that light to be dim until there is motion sensed, which will still activate the bright light. Through cold winters with snow, or hot and steamy summers with a lot of rain, this light will power through. The body of the device is totally element proof. Plus, there is no need to worry if the temperatures get unusually high, the SwiftlyDone solar outdoor light can handle it. The LED light could be a bit brighter. 80 lumens is fairly low for a security light. It would work fine as the base brightness, but might not do the job of scaring off any intruders. But if you want it just for temporary light, it would be fine. Some users have reported that the adhesive was ineffective after a few weeks. However, there is a hole at the top that allows for a screw, so if you want to play it safe, use that. You may need to buy multiple lights if you want to light up a larger area. While it may not play the role of a security device particularly well, it performs all other tasks wonderfully. The simplicity of the installation, range of the motion sensor, and compact design all make for a pretty great outdoor solar light. If you want this for just a doorway, it would be fine. However, since it does not get super bright and it is rather one-directional, you may need more for a wider area of light. Overall, the SwiftlyDone solar outdoor light is a good quality light for the price. If you just need a quick and easy motion sensor light, this is the one for you. Right now, you can grab it on Amazon for $13.22. Pocket change, and cheap enough if you need to buy multiple lights. To check out the rest of our reviews of the best outdoor solar lights, head back to Green and Growing. Here are some top questions that I found for people seriously considering buying the SwiftlyDone Solar Outdoor Light. How many adhesive patches does it come with? Only one adhesive patch, which is already on the light, as well as two screws. How dim is the dim light setting? It is about 50% of the full bright mode. How long does the light last after the sun goes down? Depending on how much light it absorbed during the day, it should last about 5 hours on an optimal charge.